There is little information around about this Polish Death Metal trio, but I'm almost sure the CD I'm dealing with is its debut. As to the lyrical aspect, the band covers topics like death, blasphemy, hell, punishment, an army of lost souls, the revenge and decadence of a man who was good but chose the left hand path because he was disappointed and forsaken by God notwithstanding his sincere faith, a witch, the fallen angel and slaves of false religions. Musicwise, the Poles lead tributes to local heroes such as Vader, Hate and Decapitated, as well as several Floridian legends, mostly Hate Eternal and Morbid Angel, prizing on triggered kick drums and tom-toms as devastating as an earthquake, frontal assaults with occasional mid-tempos but no melodic parts, no keys or synths, no intros or outros, well faithful to the traditional line. 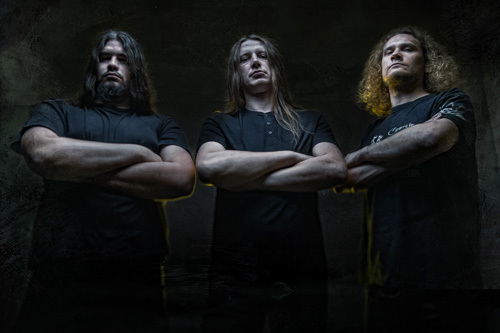 A head-on sonic collision dissipates any doubt about the three-piece instantly, while dynamic and rapid drumming embellishes the opener "Death Countenance". Thrown into a bottomless pit, we enjoy the plank of the initial guitarwork of "The War with God", followed by raw stops 'n' go, twisted riffs paired off with glass-paper growling. A memorable time change before the trilling Morbid Angel-like guitar solo together with extremely precise drums similar to a Swiss clock complete the picture. "Hell Dwellers" meanders and goes forward with a Mastic Scum-influenced riff and more elaborated rifferama. An infernal riff dear to Immolation is doing its utmost to oppress the listener; with such tank-like drums and palm-muted riffs galore, you can bet everyone will agree on that "The Army of the Damned" is definitely the album's highlight. Horns rise due to the Slayerian beginning of "Die Carrion! ", while in the ensuing seconds double growls, fast blastbeats and pinch harmonics appear. Then the pattern changes in a way not too distant from Lividity's old stuff, with vocals alà Dying Fetus and a slow axe solo for lovers of Trey Azythot's style; a riff pillaged from Nasum's songbook comes before the final part close to Lividity once again. In "Kill Me" Vital Remains' echoes and a Grind Napalm Death-recent period structure encased in US Death Metal take over, pickaxed by a guitar solo and lick veiled by acute sadness and despair. Like the title suggests, "I'm the Witch" is opened by an inflated, slow-paced and anguishing riff trailing along Infernal Majesty just after a quick start; different kinds of blastbeats pop out after the usual dose of palm-muted riffs, whereas the rest of the song sees waterfalls of hot riffs and splash cymbal beats working to keep the fulminant pace. The first part and the speedy parts of "Insignificant Truth" recur to Dying Fetus as for the vocals, and Napalm Death as to drums and guitar; that's the composition with the most variform growls and thus pretty interesting; the riffs and the vocals at a certain point are like granite, then a central part reminding Bloodsoaked and a guitar solo devoted to Deicide fill up the rest of the track. An open riff in the vein of old Floridian Death Metal opens "The Fallen One", a song mainly halfway between Malevolent Creation, Monstrosity and Morbid Angel for the most part; there is also a two-second chunky riff ascribable to Devourment and that's all the relatively modern material you can find in the first opus of the three brutal bisons from Poland! If you make an effort you're going to realize how tireless the drummer is during some passages where he's a protagonist in the background, whereas later a swift blastbeat brings Terrorizer back to our minds. The end is entrusted with the title track displaying a couple of riffs of Incantation's and Severe Torture's school, whilst the following blastbeat was clearly very similarly recorded by Luciferion a quarter of a century ago, Deicide in 1995 or Aposento this year. A key mid tempo and a good match between guitar strokes and vocals in the refrain are the remaining important notes off the closure, actually not the best track as some would expect. All the ten tracks and all the instruments were recorded, mixed and mastered in the same studio, and that's why I wonder how the engineers didn't realize the bass is so scarcely defined; yes, the production is powerful, massive and loud, but the bass lines you barely hear in the background haven't been properly separated from the frequencies of the drums, and that's a pity because they could have offered so much to the overall soundstage. This, together with occasionally slightly repetitive drumming and not the most original songwriting, constitute the weak points within an album that has a few elevate moments that make it worth the purchase. 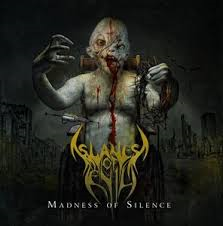 Ideal for old-school fans, still a tad harder to assimilate for the other slice of Death Metal consumers, the Polish act's first offering requires 3-4 listens to be fully appreciated by the latter; in the end the opinion of the two factions luckily coincides: "Madness of Silence" is like a grand virus on a global scale, infecting millions of like-minded heathens and outcasts. Vex - guitars, v., b.